Some people instinctively know what they want to do with their lives from a precociously young age. Don’t worry if you weren’t one of those people - Immediate Past Chair ISPA Chairman Michael Tomkins wasn’t either. Michael’s determination was also partly formed by growing up in a tiny hamlet called Hollowville, a place so small its population is not listed by the US census. It is one of nine communities that make up Claverack, New York – total population just over 6,000. By transferring his accountancy credits Michael was able to enroll in a Finance degree… which in turn became a Business Administration degree... which eventually became a Hospital Administration degree. All spurred by his desire to manage people rather than money. That first position was Assistant Director of Health and Healing at Canyon Ranch Spa. He may not have known it at the time, but Michael had finally found his true calling. Needless to say, the job required more schooling. Taking a degree in massage therapy while working gave Michael a unique skillset – academic qualifications in nursing, massage and business. 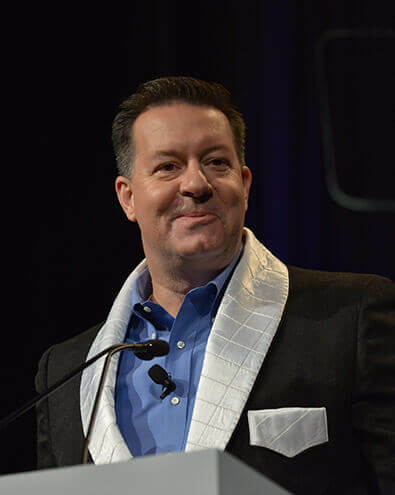 Michael has been another outstanding Chairman of ISPA, and we look forward many years of his continued leadership and inspiration for our industry. The priesthood’s loss is our gain.